Steven Defour had a wry smile when Belgium were drawn in the same World Cup group as England in Russia. And he sees no reason why he can’t battle it out with Clarets teammate Jack Cork when the sides face off in the final game of Group G at the Kaliningrad Stadium on June 28th. 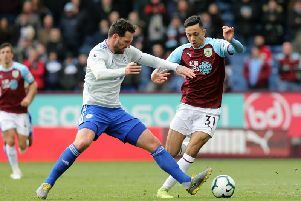 Defour, who has 52 caps for his country, has been a regular in Roberto Martinez’s squad recently, and his hopes of making the place for Russia have been enhanced after starting every Premier League game this season for Burnley. Cork, meanwhile, claimed his first England cap last month as a late substitute against Germany at Wembley, and is an outside bet to make Gareth Southgate’s squad. Defour was sat with Johann Berg Gudmundsson, whose Iceland side go to their first World Cup, on the team bus on the way to Leicester City when the draw was being made, and he was pleased to draw England: “Yeah. We watched it on the bus on the way to the Leicester game. I was watching it with Johann. “It’s a good draw for us and England I think. He has no doubts that Cork is good enough to make the squad though: “Of course. “When I see the other midfielders of the England squad, Corky has to be in it. “I’m not saying that because he’s a teammate, I’ve seen other midfielders play and I’ve seen Corky play. “He has the same, if not better qualities than the other midfielders. “He works a lot, his physical strength is really good. “When he gets the ball, he’s so calm with it, he’s always trying to find a football solution. Defour and Cork have been pivotal to Burnley’s success so far this season, and his form has boosted his chances of going to the World Cup: “Of course, everybody is talking now, especially this week when we got to fourth, about Burnley, even in Belgium.